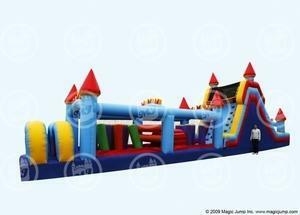 A Bouncing Adventure's latest addition to its line of inflatable obstacle courses is the Castle Course. This ride is a 62 foot long maze of fun with a beautiful design that is sure to attract any passerby. The Castle Course is an eye-catching piece that does not skimp on any of the fun and challenges. Its entrance welcomes each participant into his lane through an arching tunnel that gives way to a series of pop up obstacles to push past. Once through, the challengers must pass a pair of horizontal hurdles then dive into and crawl through a tunnel. After exiting the tunnel, the participants push through another set of pop ups before enjoying an 11 foot wall climb and slide down the end of the Castle Course.